Novels and movies have glamorized the image of the pirate. We can imagine ourselves dressed in puffy shirts, with swords at our side, swinging on ropes between various high points of ships rigging, sailing to exotic lands full of treasure and beautiful women. Of course deep down we know that pirates have always been cruel, dirty, smelly, dangerous, murderous filth bringing misery and death to their victims, only to have their short lives end in early death. But even as images of the scum of Somalia pervade the news media, we still imagine Johnny Depp, Errol Flynn or Douglas Fairbanks, in some sunnier version of the Disneyland ride whenever we hear the word pirate. There are societies of people who dress like a pirate, talk like a pirate and swagger like a pirate. 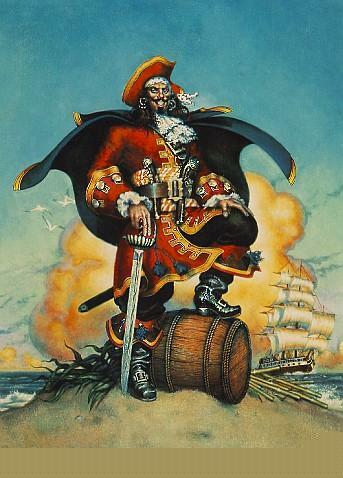 But again this is the fictitious pirate image, not the Somalian in the open boat who would shoot off your hand to steal your Seiko. With this seductive enchanting vision in mind, I decided to attend a local Pirates Class. The colorful flyer was stapled to a telegraph pole, and the first class was free. To save time, I donned my raggedy calf-length pants tied at the waist with an eight-inch wide leather belt, tied my white ruffles shirt with the billowing sleeves into a knot at the waist, knotted on my bandana and place my tri-cornered felt hat atop it. I grabbed my rubber sword and practiced some pseudo Cornwellian aaaarghs on the way down. The same flyer for the Pirates Class was on the door and in I strutted, only to find all sorts of alien and diabolical ropes and pulleys atop even more diabolical beds of torture. Alas, my landlubber friends, I was once again a victim of my failing eyesight. You see, the flyer did not say Pirates Class at all. It said Pilates Class. I would have stayed, but I was asked to leave. Jeffrey the Barak drinks rum while laughing atop the mainmast. PreviousPrevious post: A 70’s dinosaur falls into eDrums.